Everyone who has ever found his or her calling realized at some point, “Hey, I might be good at this.” That’s how some people are drawn to puppetry and others are drawn to proctology. Or piracy, for that matter. It is not known when Edward Teach noticed that he had a gift for terrorizing people, but he eventually became one of the most notorious pirates of the Caribbean. 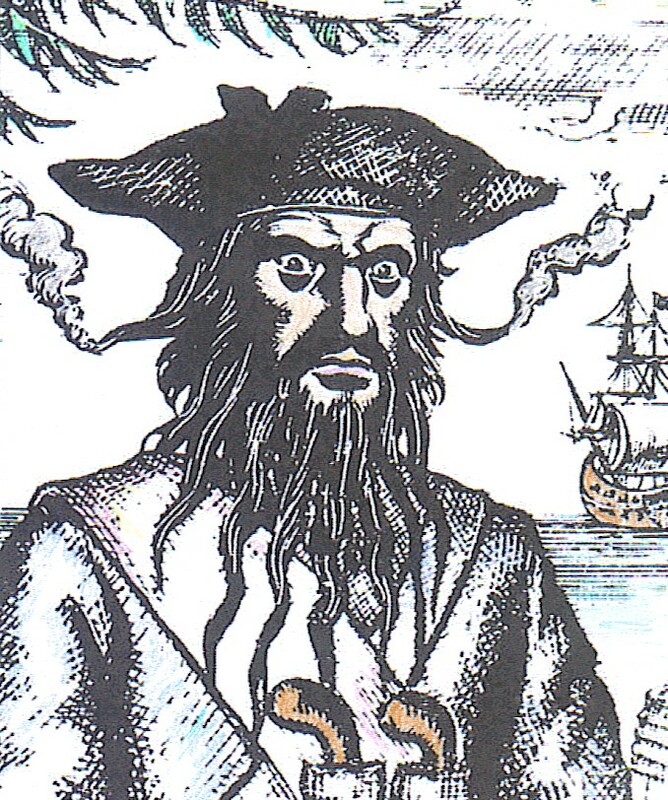 He is known to history as Blackbeard. In the early years of the 18th century, Teach developed his sailing skills and silenced his conscience while serving on a privateer during the so-called Queen Anne’s War (1702-1713). Privateers were privately owned ships that were hired by governments to fight their enemies. Crew members didn’t necessarily feel any loyalty to the country for which they were fighting, but they got to keep whatever they could steal. It was only a small step from that into piracy, and that’s the path Edward Teach took. A pirate named Benjamin Hornigold gave him his big break in 1716: command of a small ship in the pirate’s fleet. Teach showed a natual flair for it, and enhanced his fearsome reputation by allowing his black hair and beard to get quite long. According to some historians, he braided pieces of rope and ribbon into his ’do; during battles he would set fire to these fuses so that his hair and beard were smoldering (see above). That struck fear into Blackbeard’s opponents, or at least convinced them that he was seriously deranged. Blackbeard captured a French merchant vessel in 1717 and converted it to his flagship by outfitting it with 40 guns. He renamed it Queen Anne’s Revenge, which the pirates probably all found delightfully ironic. Over the next year Teach’s fleet of ships grew; he commanded over 300 pirates who captured and robbed vessels from Virginia to the West Indies. When Blackbeard flaunted his power by blockading Charleston in May, 1718, the authorities decided that something had to be done. Blackbeard and his men were hanging out in North Carolina playing horseshoes and sipping Cosmopolitans that November when a British naval force led by Lieutenant Robert Maynard trapped them at Ocracoke Island. Teach was now on a ship called Adventure, since Queen Anne’s Revenge had run aground several months earlier. Maynard’s sloop sustained heavy fire from Blackbeard’s cannons, but during the battle, Maynard ordered most of his men to go below deck in anticipation of being boarded. Blackbeard eventually got close enough to use grappling hooks and led his men onto Maynard’s damaged ship. It appeared to be almost empty; the pirates momentarily thought they had won. Before they could high-five each other, though, the hiding British sailors came out firing. Maynard and Teach shot at each other and then fought with swords. Although wounded, Blackbeard seemed to have gained an advantage — but then a seaman jumped him from behind and slashed his throat. A post-mortem revealed the extent of his injuries: Teach had been shot 5 times and had at least 20 lacerations. Taking no chances, Maynard had Blackbeard’s head cut off and tied to the bowsprit of the navy vessel. Maynard probably turned to his men and said with a big grin, “That’ll teach him. Huh? TEACH. Get it?” But the sailors were too exhausted to throw Maynard overboard. By the way, there is still some controversy among historians about whether Edward Teach was his real name. Pirates, like strippers, tend to use pseudonyms. Just because they’re good at what they do doesn’t mean they’re proud of themselves. This entry was posted in History and tagged Blackbeard, Edward Teach, Queen Anne's Revenge. Bookmark the permalink.